If local media reports are correct, it would appear that the Bond 22 production crew will be heading to Austria for location shooting next year. News reaches MI6 that director Marc Forster, producer Barbara Broccoli and director of photography Roberto Schaefer visited Bregenz in late June to scout a location for a scene for the 22nd James Bond film. Bregenz is the capital of Vorarlberg, the westernmost federal state of Austria. The city is situated on the eastern shores of Lake Constance, on a plateau falling in a series of terraces to the lake at the foot of Pfänder mountain. 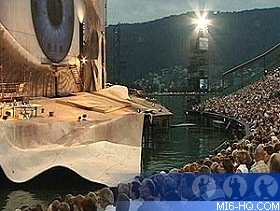 As well as its natural beauty, Bregenz also features a unique Opera stage which floats on the water (known as the "Seebühne"). The stage is a key tourist attraction of the region, and due to the expensive sets used in the productions, each opera is featured for two consecutive years. 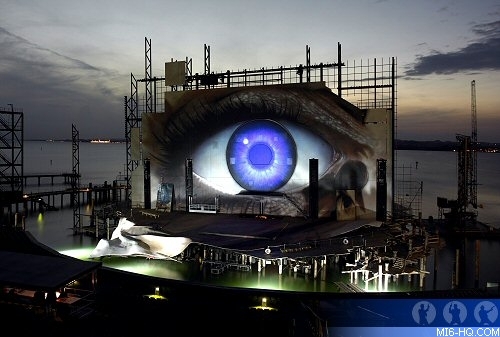 Reports state the Bond crew arrived during the Bregenz Festival and witnessed the production of Tosca, which is scheduled to be hosted on the floating stage until late 2008, complete with an enormous rotating eye and huge LED wall. Festival speaker Axel Renner confirmed the crew attended and filmed a piano rehersal of the Tosca production. Altogether, eight representatives from the production team were in attendance to determine whether the stage would work as a location in the film. 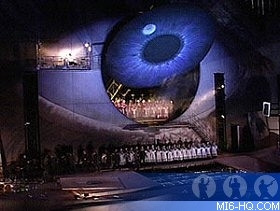 The scene is rumoured to see James Bond visiting a performance of Tosca and "intervening" in some manner. If it makes the final shooting script, and using the real stage and Opera with 7000 spectators proves suitable, three days of shooting in spring next year have been penciled in. A decision is expected to be made this autumn (fall). The production team also visited the Festival Opera House in the city, and are currently scouting locations for the film throughout Europe. Tosca is an opera in three acts by Giacomo Puccini to an Italian libretto by Luigi Illica and Giuseppe Giacosa, based on Victorien Sardou's drama, La Tosca. The work premiered at the Teatro Costanzi in Rome on January 14, 1900. One of the most dramatic of operas, Tosca is, according to Opera America, the eighth most performed opera in North America. Writers Neal Purvis and Robert Wade, who handed over the Bond 22 first draft script to Paul Haggis earlier this year, included Body Worlds - another real-world tourist event - in the previous film Casino Royale. Production designer Peter Lamont, who has been a crew member on 18 James Bond films, will not be continuing with the 22nd in the series - due to start shooting in December this year. Lamont has only missed three Bond films in total – the first two, Dr. No and From Russia With Love were made before he joined the team and he was absent from Tomorrow Never Dies because he was already committed to Titanic (for which he picked up an Oscar). Despite commenting on the state of Bond 22 earlier in the year, leading many to believe he was continuing his role, Lamont told the audience of a James Bond celebration event at Pinewood Studios this weekend that he will not be participating in the upcoming film. He told the crowd that Dennis Gassner will be the production designer for Daniel Craig's second outing as 007. 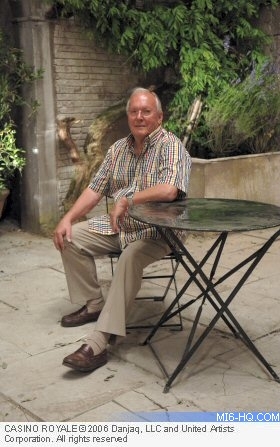 Above: Long-running crew member Peter Lamont (pictured left on the set of Casino Royale) hands the Production Design baton to Dennis Gassner (right), who was brought in by director Marc Forster to create his own look for the film. Fellow Oscar-winner Gassner has just completed The Golden Compass. 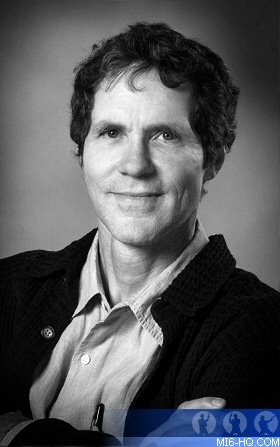 His other films as production designer include "Road to Perdition", the Coen Brother's "O Brother, Where Art Thou?" and "The Man Who Wasn't There". Gassner is already familiar with Daniel Craig, as he has starred in both "Compass" and "Perdition". Another tidbit mentioned at the Pinewood event from Bond crew members was that Bond 22 will feature a ski sequence. This will not come as a shock for those who read earlier comments from director Marc Forster that the Swiss Alps were being considered as a location. With news of the location scouting in Austria, it would appear that Daniel Craig will be taking part in some winter sports within Europe during his second outing as 007. 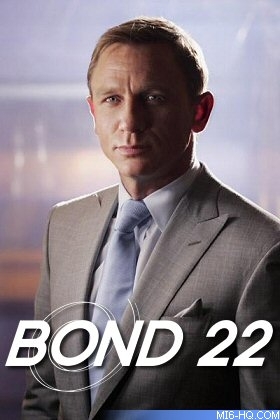 Although an official press release had already stated that Bond 22 production would be based at Pinewood and not Barrandov Studios in Prague, Variety followed up with a report on the shift in location. "Citing the lack of financial incentives in the country, 007 production company Eon has informed Prague’s Barrandov it will not use the studios for the next movie in the series, according to Barrandov head Vladimir Kuba." "London-based Eon confirmed it is basing the Marc Forster-helmed pic, which starts shooting in December, at the U.K.’s Pinewood Studios but declined to comment on reasons or on what other locales may also be in the package." "However, Kuba was told that the lack of Czech incentives killed Barrandov’s chances, he said. The “Casino Royale” shoot, based mainly in Prague, marked a high-water mark for foreign production at Barrandov. Aside from Bond, the studio also has lost the “Hellboy” franchise, worrying Czech industryites." According to a French fan site, Sony Pictures France have confirmed the French release date for the 22nd James Bond film will be 5th November 2008 - two days ahead of the previously announced Sony Pictures (USA) date of 7th November 2008. Fans in the USA and Canada will now be wondering if the 7th November date will be used for North America alone, with the UK releasing slightly earlier too, as with Casino Royale.